The presidential insult followed a weekend gathering of Koch officials who repeatedly condemned Trump’s trade policies, the explosion of government spending under his watch and his divisive tone. The intra-party feud could hurt the GOP in this fall’s midterm elections and beyond. While the Kochs refused to endorse Trump’s first presidential run, the president’s loyalists don’t want his 2020 re-election campaign bogged down by lingering bad blood. The Koch network boasts an army of grassroots activists across 36 states and has promised to spend between $300 million and $400 million on politics and policy this election cycle alone. Responding to Trump’s social media attack, Koch spokesman James Davis was measured. “We support policies that help all people improve their lives. We look forward to working with anyone to do so,” he said. 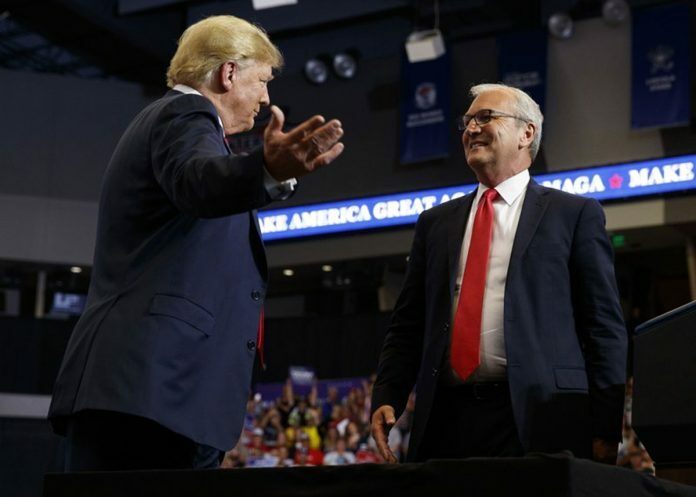 The day before, the Kochs’ political advocacy network announced it would not back the GOP candidate in the North Dakota Senate race, determining that Republican challenger Kevin Cramer’s record on government spending made him no better than Democratic incumbent Sen. Heidi Heitkamp in the marquee Senate contest. “We’ve got a message for lawmakers across the country. We are raising the bar, raising expectations,” Koch lieutenant Emily Seidel told donors Monday. While the move echoed across the political world, Republican operatives quietly dismissed the practical impact of the Koch’s decision on the North Dakota Senate race, where Cramer’s campaign believes he has a double-digit lead in the deep-red state against the Democratic incumbent. Yet there is a desire for the Kochs to cooperate with Trump allies in other states, such as Nevada and Montana, where Republican candidates are considered more vulnerable. Some Trump loyalists were furious at perceived contradictions in the Koch network’s behavior. Vice President Mike Pence, a close Koch ally, has so far been silent on the feud. His office did not immediately respond to a question about Trump’s Twitter attacks.